In 2018, when people hear the name “Babe Ruth” they think baseball and then America. For many sports fans, he is the greatest home run hitter to ever play the game, while others think of him as a man who lived out the excesses of fame, smoked cigars, drank too much and slept around as his belly grew. He had a difficult orphan childhood, eventually rising from the bootstraps of poverty and turning himself into an unforgettable icon. In short, Babe Ruth is a spitting image of the 19th and 20th century American dream — a struggling yet rugged individual who overcame the odds to become a success. In Japan, this mythic view of Babe Ruth is tossed around similarly. Currently, the Anaheim Angels' 24-year-old Shohei Ohtani, a player who can both professionally pitch and hit, has been given the title of “Japan’s Babe Ruth” due in part to his ability to hit for power and strike out opposing players. It is a giant compliment — and with that title comes enormous pressure. After all, to be greater than Babe Ruth would mean to hit more than 714 home runs and keep a career earned-run-average (ERA) under 2.28. No easy feat in today’s major league baseball. According to Japanese baseball historian Robert K. Fitts’ well-researched and incredibly entertaining book, Banzai Babe Ruth, the Great Bambino’s name in Japan had a mythic quality to it. After joyfully going through Fitts’ history, there are definite moments where “the Babe” appears human — a man perhaps “too big for Japan,” both literally and figuratively. From Fitts’ extensive coverage, I end up seeing three Babe Ruth’s, stretched across 14 years. 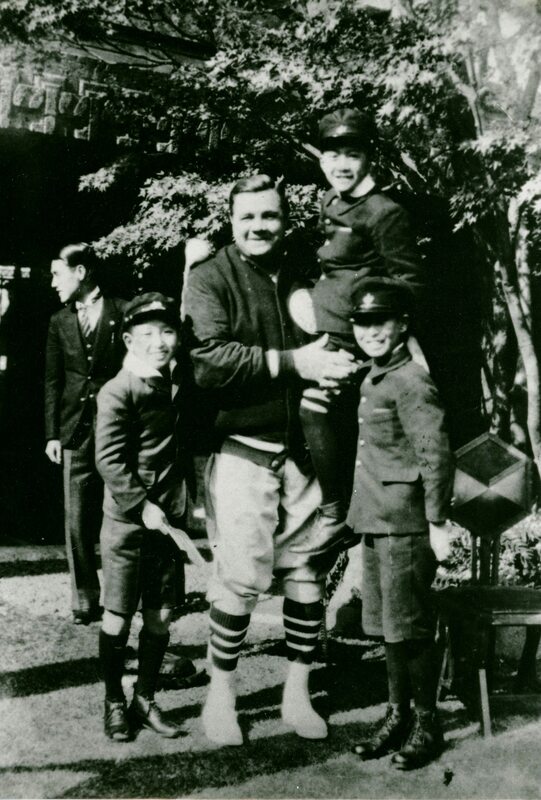 In 1934, when George Herman Ruth applied for his passport to travel to Japan (only ever in the past leaving the U.S. to visit Canada and Cuba), the Great Bambino discovered how old he actually was. For his entire life, he believed he’d been born on Feb. 7, 1894 but his birth certificate read Feb. 6 1895. Happy to be 39 — again — this brief moment of time travel hadn’t reduced the aches in his knees. After over two decades playing baseball for the Boston Red Sox and New York Yankees, Ruth knew the game would soon be passing him by. As he pursued managerial opportunities, rejections came rolling in. Everyone seemed to love watching him play, but giving the Babe full command of a roster was something many teams, including the New York Yankees, feared would backfire given his hard-partying lifestyle. His barnstorming trip to Japan would reinvigorate him with purpose. The country had been cultivating a devotion toward baseball ever since Horace Wilson and others introduced the sport to the country back in the early 1870s. Fans truly enjoyed Ruth’s larger-than-life persona. To many in Japan, he was so America — loud, large, brash, confident and funny. He was most welcome to come and play in front of adoring crowds. Just don’t live here, some may have said. He wouldn’t have wanted to, though he did love to be cheered. That came tenfold, especially on Nov. 2, 1934, as he and the rest of this recently assembled team of all-stars (including nine future Hall of Famers such as Yankees hitter Lou Gehrig and pitcher Lefty Gomez, who managed to film a bit of the trip) made its way to the Imperial Hotel. Ruth waved an American and Japanese flag at the roaring crowds, and they in return yelled “Banzai!” back at the Babe. Wanting to join in, Ruth inevitably yelled the word back. 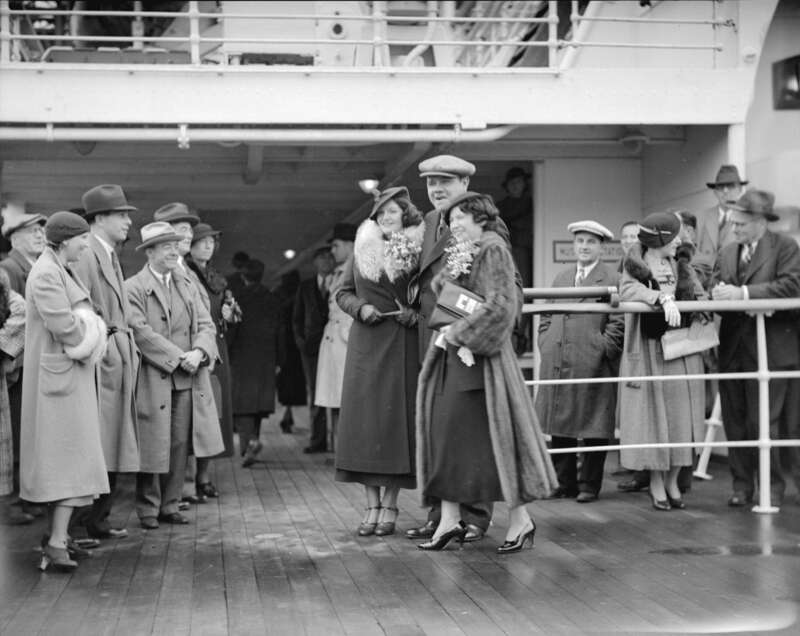 Ruth’s trip was sponsored by the Yomiuri Shimbun, but the expensive decision to bring an all-star American baseball team to Japan wasn’t fully supported, especially in 1934 Japan, where ultra-nationalist groups had multiplied ever since Charlie Chaplin’s 1932 brush with assassination. A simple way to illustrate the volatility surrounding Ruth is to mention that Yomiuri publisher Matsutaro Shoriki was stabbed less than three months after the end of Ruth’s tour. His crime? Allowing Ruth and the Americans to play baseball in Emperor Meiji’s stadium — a gesture of dishonor, the assassin believed. For those of you reading this series, this author believes that if the ultranationalists had really wanted to ignite a war with America, they should have killed Babe Ruth. But they didn’t, and Ruth went on to entertain crowds numbering in the tens of thousands. For those scoring at home, the Sultan of Swat walloped 13 dingers in 18 total games, batting .408. He struck out seven times and even stole a base — this last stat perhaps the most surprising. The Americans won every single game, with one in particular being a nail biter: a 1-0 pitcher’s duel between a 17-year old high school pitcher turned pro named Eiji Sawamura — who eventually became a star Japanese baseball player, then a grenade-tossing soldier during the war and, after his death, a respectful symbol of the growing pains of a country devastated by division and destruction. Ruth was his charming self during games, holding parasols while standing in the outfield during games, talking with children and pranking other players by secretly switching out his notoriously heavy 44-ounce (about 1.2 kilogram) baseball bat. The games brought joy and a sense of diplomacy between the two countries, with several American reporters writing that the Great Bambino had found a way to squelch international tensions despite ongoing violent incidents occurring between Japan and China. He hadn’t, but the charm Ruth exuded (even wearing a kimono) endeared himself to Japanese baseball fans. Still, Babe Ruth was a professional baseball player, not a trained diplomat, and one incident involving geisha shows that he didn’t really have any interest in building bridges between the countries. During one restaurant outing, Ruth (who’d come with his wife Claire and step-daughter Julia) downed quite a bit of sake and “announced that he could pickup [an apprentice geisha] with one hand.” Due to the years of refined training geisha go through, learning ‘music, dance, storytelling,’ and other art forms, many Westerners mistake their charms as propositions. Ruth became enamored with one geisha and “began fondling” her. It’s unclear if the teammate’s katakana was accurate enough for the geisha to understand, but Ruth understood. Keep your hands to yourself. Another moment mentioned by Gibbs involves Ruth and a kind and well-respected sushi chef’s beard. When Ruth posed with the man (known as the Bearded Tempei), Ruth approached “the chef with a loud ‘Hello, Santa Claus’” and then “pretended to pull a rabbit from” the chef’s beard. On Dec. 7, 1941, while staying in his Manhattan apartment along Riverside Drive, Ruth heard over the radio the news that Japan had attacked Pearl Harbor. Immediately he took it as an epic sense of betrayal. What were the cheers for? What was the meaning of the tour? Soon, the Great Bambino opened his window and threw out a Japanese vase from his 11th floor window. As it smashed on the sidewalk, his wife attempted to pluck from the Babe’s grasp anything she wanted to keep. With the end of the war came calm and forgiveness. Shortly before succumbing to throat cancer, Ruth, according to Fitts, was able to look back on that 1934 barnstorming tour across Japan with tempered emotions. Starting in 1946, his health had started to deteriorate, but he was still of sound enough mind to remember his years in Japan. “Despite the treacherous [Pearl Harbor] attack the Japanese made on us only seven years later,” Ruth said, “I cannot help but feel that the reception which millions of Japanese gave us [during the tour] was genuine... No doubt there were plenty of stinkers among them; but looking back at the visit I feel it is another example of how a crackpot government can lead a friendly people to war." As well as the statue, baseball fans can also check out Japan’s Baseball Hall of Fame and Museum, where memorabilia has been kept from that 1934 tour — including the actual poster of Ruth’s face used to advertise the tour. Next month, we’ll focus on activist and writer Margaret Sanger’s struggle to publicly discuss birth control in Japan in 1922. ".....a crackpot government can lead a friendly people to war." That does not apply only to Imperial Japan. How many times have we Americans allowed ourselves to be led into overseas calamities?